Its been a pretty difficult week for anyone trying to fish the surf but conditions look like they will be changing as we head into the weekend. The predicted windshift to the southwest on Saturday and northwest on Sunday and Monday should get everyone back into the game. The pompano, whiting, croaker, jacks, bluefish, and mackerel should all be available to bend some rods. 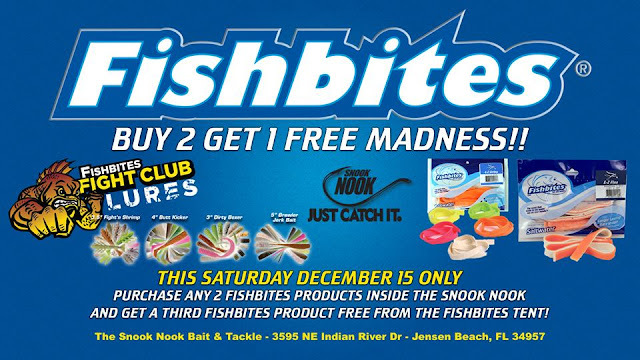 There is some rain predicted for Saturday so stop by the Snook Nook and pick up some extra Fishbites during the Buy 2 get 1 free promotion along with any other tackle you might need during their Annual Customer Appreciation Tent Sale.Billy Carr and Brett Burford from Fishbites will be there with plenty of product and will be available to talk about the entire line of great baits they offer. As previously mentioned I will be there most of the day to answer any questions you might have regarding the great surf fishing that is happening right now.